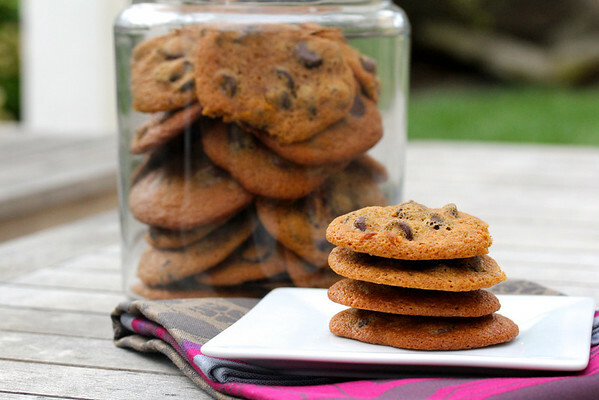 These whole wheat chocolate chip cookies are practically health food. 100% whole grain and bittersweet chocolate chips? Don't those contain whole grains and flavonoids? Totally health food, right? Perfect for back to school. 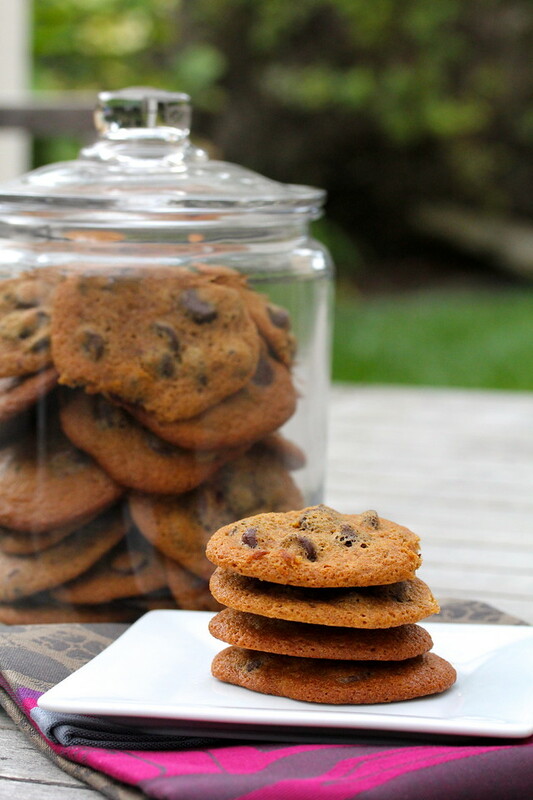 The texture is soft and chewy, and the combined flavors of the whole wheat and dark brown sugar along with the bittersweet chocolate chips may put these on on your list as one of your favorite chocolate chip cookies. I promise you, these cookies will be a huge hit. I baked about four dozen of them for work, and they flew out of the cookie jar. I don't think I've seen anything I've shared at work get as much love as these cookies did. I saved a few for my little grandsons and they LOVED them. When I started mixing these cookies the evening before, I had just skimmed the recipe to make sure I had all of the ingredients (Don't you love it when you do have all of the ingredients and you don't have to go to the store? I do). I preheated the oven, melted the butter, mixed in the brown sugar, added the eggs, dry ingredients, and the chips, and then read "refrigerate overnight." Okay.... Breathe.... Turn of the oven, reset the alarm and go to bed. When will I finally learn to read a recipe all of the way through? *All claims about these being health food are for entertainment purposes only and to make you smile I hope. Makes 48 cookies. Adapted from King Arthur Flour Whole Grain Baking: Delicious Recipes Using Nutritious Whole Grains. Melt the butter in a saucepan. Remove the pan from the heat, add the sugar, and stir until the sugar is melted. Pour the butter/sugar mixture into a medium bowl and allow it to cool to lukewarm. Add the vanilla, baking soda, espresso, baking powder, syrup, and vinegar. Add the eggs, one at a time, beating the mixture well each time. Line baking sheets with parchment and drop the dough by tablespoon onto the sheets, about 2 to 3 inches apart. I use a small scoop to create (somewhat) even sizes. Bake, two sheets at a time, for 12 to 13 minutes, rotating the sheets half way through, until they are just beginning to brown. Cool the cookies on the baking sheets. Loosen the cookies from the parchment after about 5 minutes. I am participating in the Creative Cookie Exchange. Healthy, smelthy. These just look delicious, Karen. And I did enjoy the image of you racing around in the morning with the timer. Perhaps you need one that clips on. :) Also, I am coveting your cookie jar. I'm thinking about one of those that hangs around your neck! The cookie jar is from Target and costs about $7. Go and get one! What a bargain! If only I had a Target near by. Deep sigh. I'm always looking for the next great chocolate chip cookie, Karen. Thanks for another great looking one to try! Love them! Thanks for being a co-host for the Creative Cookie Exchange. You really nailed the theme with your beautiful photo and healthy cookie recipe. looking forward to what you might be cooking up for next month's theme?? Thank YOU for all of your hard work on this! I think these look great for co-workers and grandsons too. They would please everyone and I wish I had one now myself too! Love it, healthy chocolate chip cookies! Hahaha...whole wheat anything means it's entirely healthy. :) I love your story of never reading recipes all the way through. Happens to me all the time! These look super tasty! A nice refreshing spin on a classic cookie! I just love chocolate chip cookies, and can barely let them cool before I have to bite into one. And yes, whole grains are good for you, and so is chocolate - if only they went with red wine we would be totally set ;). I see a big batch of your cookies in my future. I think that red wine would work here, don't you? Except for the kids of course! Totally health food. Totally great cookies. And worth having to carry around the timer and bake while getting dressed. (Darn those recipes with dough that has to chill overnight). Thanks so much for all you have done to make this Creative Cookie Exchange happen. I can't wait to see what each month will bring. Now you're talking!! I love whole grains in my cookies, but it's the bittersweet chocolate that is pulling at my heart!! Saw these babies all over pinterest today. A sign of a good cookie! They are definitely on the list in my cookie rotation. It was great that the grandkids loved them too. Thank you for visiting! This made me laugh because I do that all the time (not read the recipe closely enough). And unlike you, I am afraid that when my alarm goes off I always choose sleep. :) So happy you didn't! And I love whole grains in my cookies--definitely health food! ;) Thanks so much for joining us! I think if it has whole wheat or wholemeal in the title, it MUST be healthy! Your story gave me a chuckle and I love the sound of the recipe. My household will love them! !